What is your earliest memory? As we grow older, our memories of the small things - like your favorite toy when you were seven - tend to be replaced by the ones of big things, like the time you broke your arm on the swingset. We also tend to block out the scary things, the bad memories of the times you got chewed out by your parents or the fights that you got into with your siblings. These things seemed so big to us at the time, but now they're as faded as the pictures of you in that scrapbook your mom only brings out to entertain the guests. Neil Gaiman's’ “The Ocean at the End of the Lane” is 90% one child’s memory. Of course, the memory that takes up the book has been erased by the women that live at the end of the aforementioned lane, but still, we can relate. There is a kind of magic that hangs lazily over your childhood memories. You know you have lived it, and you know the most basic of things about it, yet it shimmers, not quite solid. Gaiman harnesses this feeling in the novel. It fits snugly in the Fantasy genre, complete with dual worlds, the people that keep things straight with some sort of magic, pesky “fleas” that like things better crooked, and the scarier things that eat the fleas. The main character is never named, all the better to put yourself into it, despite it’s English countryside in the late 20th century setting. After the deaths of his kitten and an opal miner (unrelated), he meets the family at the end of the lane. They are the Hempstock’s, older than this world and protectors of it. The main character joins the youngest Hempstock, Lettie, on a mission to get rid of some evil trying to crawl it’s way to our world. They fail, and the result is that he becomes a door, and the very thing they tried to banish walks through. The evil manifests itself in After causing some havoc, it is time to get rid of it for good, only they need help. In the hierarchy of things you don’t want in this world, what comes to take care of the little evil would be a big, angry dog that the Hempstock’s can barely control. It takes a sacrifice to get rid of them, and though nothing is the same afterwards, at the same time, it is. “Nobody looks like what they are inside, really” says Lettie. Much of the book focuses on things that are ordinary to the naked eye but are anything but. Another call back to childhood, where our toys could talk, and an odd shaped rock was actually a talisman from another land. In this book, friendship is life saving to a lonely boy who prefers books to people. I give this book a 3.5 of 5. Gaiman continues to weave worlds that are easy and exciting to get lost in, no matter how many layers they may have, or how many shadows lurk in the corner of your eye. The world of Lane may not be as expansive as American Gods, but it’s also not as small as the Graveyard Book. It sits defiantly in the middle. It is a quick read as well. This book is not bad by any means, and will linger in your memory, ready to welcome you again, just like Lettie Hempstock’s ocean. 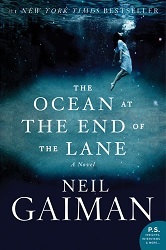 For more reviews or to buy The Ocean at the End of the Lane from Amazon.com, click here.